What do you eat before a run? Or should I ask, do you eat anything before you run? It's different for everyone and can depend on many factors such as how far you are running, feelings of hunger, the sensitivity of your stomach, etc. Even still, what works for you at one point in your life may completely change. For some people, eating anything can seem daunting and impossible. While others can tolerate almost anything. Dairy and fructose (the sugar found in fruit) are the usual suspects of GI distress (use your imagination). Start with refined grains. Yes you heard me right. Whole grains take longer to digest and when exercising you went energy (aka carbohydrates) ASAP! Add some protein or fat. This will give your meal some staying power and dull the spike in blood sugar so that you don't crash later on. Peanut butter! You get protein and fat...and it's delicious. Once you find something that works (and this may take some time) stick with it. Over time you may have to experiment again if you notice any GI upset. Today I put off my run until the afternoon because I had plans to study with Molly at a coffee shop at 9am. Therefore, I had overnight oats for breakfast instead of my usual pre-run toast. For lunch I had leftover pizza and a few pieces of chocolate. Knowing that I would need to run soon since the clouds were coming in I ate one of my homemade granola bars. I have a fear of being hungry while out on a run, especially a hard run. unfortunately, the clouds came in rather quickly and so I changed quickly and headed out the door trying to beat the storm. Well, I certainly did not beat the storm. It was pretty eerie actually. The wind was super intense and then the rain came down aggressively for a bit. I got drenched. A few tempo miles in and I was determined to cut my run short and just run home. But on my way back home the rain stopped and the sun came back out so I changed my mind and kept going. The unfortunate thing is that running from the rain threw off my stride leading to a few aches and pains. Additionally, that granola bar did not have time to digest and I had some GI distress. I survived and made it through my run, but it was challenging for sure. It wasn't a progressive tempo, but I got it done. Six miles with an average pace of 8:19. I hope Julie can run my tempo with me next week! Our half marathon is exactly one month from today. It reminded me the importance of fueling my body for performance. In the future I am going to do better about choosing foods that will not upset my stomach, however, like I said it is trial and error. Tomorrow I am taking the day off of running, though, so this shouldn't be a problem. Enjoying cut back week. Guys, I forgot to take pictures of what I ate yesterday so that I could post this this morning. Oops. And then I vowed to take pictures of my food today and definitely forgot to take a picture of my snack...well one of my snacks and my lunch. It's a make shift What I Ate Wednesday post today. I woke up super well rested at 6:30 this morning. I washed my sheets yesterday and my bed was so comfy last night. 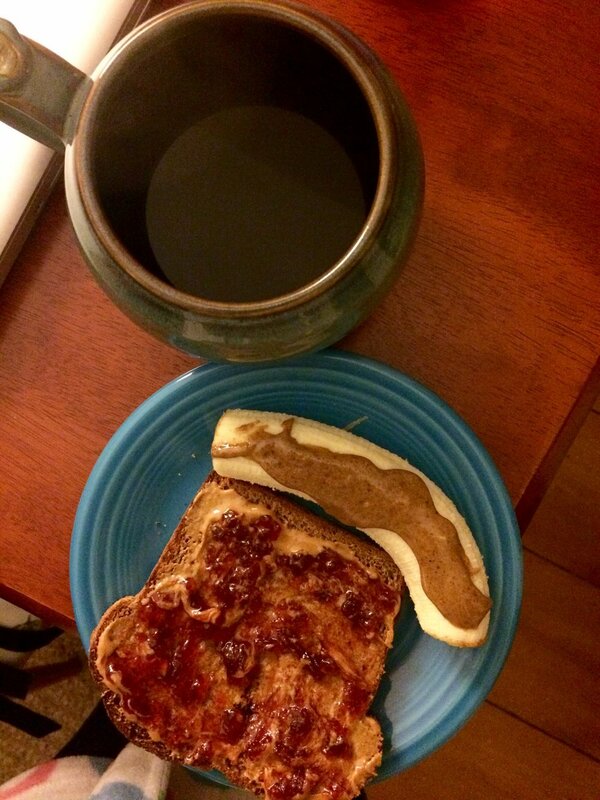 It's the little things in life...My stomach was still feeling a little bit off so I stuck with toast this morning (one slice with butter and jam and the other with peanut butter). I also had my first tempo run and needed the carbohydrates for fuel and I will not let any of my Great Harvest loaf go to waste. Thank you to Kath for getting me addicted to Great Harvest bread. Luckily I live in a place where a bakery exists. Where I work there is an indoor farmers' market and Great Harvest sells there and I love it. Side note about my stomach being a bit upset lately. I had a physical on Monday and my doctor asked me if it could be from something I have been eating. My job is to pay attention to what people eat and how it affects them and yet I don't do the same for myself. The only food that I have recently been eating more of which I don't normally eat are bell peppers. They were on sale this week and I bought four...impulse buy. So then my doctor starts telling me that peppers are high in a type of carbohydrate that isn't easily digested in the small intestine...blah blah blah... I just look at her and I ask, "Are you going to put me on a low FODMAP diet?" She starts laughing, realizing that I am in the nutrition profession and that I have known what she was hinting at all along. She shook her head and suggested that maybe I food journal though. Isn't that my recommendation as a future RD?! I felt put in my place. But I had better plans to take pictures of what I eat...although clearly I am slacking. Moving on to that tempo run! I decided to run on the treadmill because the weather yesterday said freezing rain this morning (no...just no) and because then I could be sure that I was running at the right pace. I can't wait for my running watch to arrive. It's pink...insert emoji with the waving hands...Do you guys know which one I am talking about? It's my favorite and I definitely abuse it. I went into the run thinking that 5 miles on the treadmill would be absolute torture and so I aimed for 4, cutting my warm up and cool down from a mile and a half to just a mile. However, I needed the full mile and a half to warm up. Then I cranked up the pace until it said 8:06 being careful to not look at the level until I hit my target pace because anything over 7 freaks me out a bit (anyone else scared of shooting off the back?). Two miles at level 7.4 went by so fast. That's a lie. The first mile went by so fast and the last mile dragged and I kept staring at the mileage. My sister's mantra stuck in my head, though. "Run the mile you're in" she wrote on her blog. While running I also listened to an episode of Food Psych about orthorexia which had me captivated. By the time the mile and a half cool down came around I figured why not finish out the full 5 miles?! I spent the rest of the day doing homework with my friend. I brought leftover spaghetti and a blood orange to her house for lunch. Before I left I had a snack of a yogurt topped with some cereal. I have come to the conclusion that I love yogurt but without something else it just doesn't fill me up. I went to the store on my way to her house and picked up some Uncle Sam's Raisin Bran cereal. I chose an on-sale brand and it has only four ingredients, winning! I love adding some crunch to yogurt and extra carbohydrates for marathon fueling. Dinner tonight consisted of roasted sweet potato nachos. I have really been loving Mexican-inspired meals lately. It could be the cheese. I love cheese and salsa and beans and guacamole. I love it all. I decided to take a break from enchiladas tonight since I've had them three days this week already. I should have roasted the potatoes longer but some were getting dark. Others were still a bit soft but still delicious.